Didn't the Good Humor Trucks carry these ? I think so. But not Bungalow Bar......tasted like tar......the more you eat it....the sicker you are " !!! Hi, Alan. I did a bit of Googling on this. Apparently, a Creamsicle has ice cream at its center, whereas a Dreamsicle's core is ice milk. 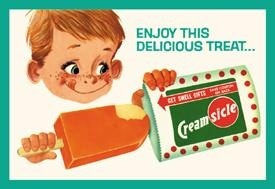 Can anyone explain the difference between a Creamsicle and a Dreamsicle?